I’ve often opined on how Set 2’s wildly varying power level from card to card is a problem for limited, and it certainly was when it came to my sealed pool. I was hoping to get any kind of playable 2-drop, but I whiffed on that. I would’ve played a completely off-faction Stranger, even! Just anything to do on turn 2. As I mentioned last time, I don’t think it’s correct to keep trying to play my matches that count when my deck has this one glaring weakness, so I decided once again to hold off for a week in the hope that the Set 1 pack will be my salvation. This was a pretty rough one. I thought the deck was quite powerful, but it lacked what many aggro decks lack in limited: a good way to come back once you’re behind. 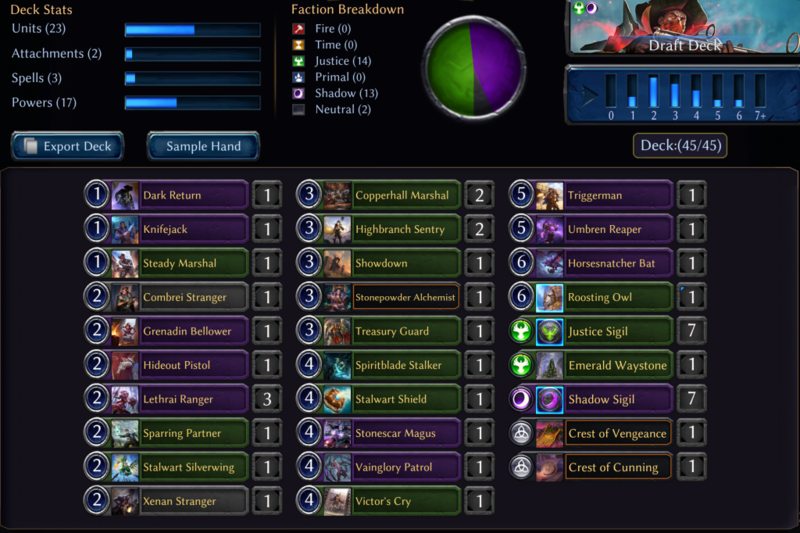 Outside of Umbren Reaper and Stonepowder Alchemist, I didn’t have any form of reach, and the dorky little creatures that made up most of the list were terrible topdecks on turn 7. Pack 2, Pick 1, I took Roosting Owl over Minotaur Lighthoof. I wish I had that pick back, but at the time I had very few cheap cards, so I wasn’t so certain that I would be aggressive. I also took my first Lethrai Ranger over a Crownwatch Cavalry, which wound up punishing me as I got plenty of Lethrai Rangers later in the pack. I would have much rather two Rangers and a Cavalry than the three Rangers I wound up playing. Ah, well. I wound up getting punished pretty hard for playing those two Crests (one of which I first-picked out of a very weak pack). I’m not saying I shouldn’t have played them – the pseudo-card advantage they bring is far too powerful – but you do have to pay a cost in the form of the Crest being depleted, and it hits a lot harder when you’re mulling into a Sigil and two Crests in your aggro deck. Ultimately, I think this deck was a bit better than 2-3, but aggro decks can’t afford to stumble at all, and this one did a few times too many. Now this one went a lot better. I even had a few cuts to make! That’s rare in this format, where you often find yourself barely scraping by on playable cards. I whittled it down to this beautiful pile full of my favorite commons in the set (Valkyrie Arcanist, Vainglory Patrol, and Extinguish). The deck was a little light on removal, having only Extract, Extinguish, and Mithril Mace to actually kill things, but it managed to put a ton of pressure on the opponent via flyers and Lethrai Nightblade. Memory Dredger was a massive beating, as it usually is, and Beastcaller’s Amulet almost always found its way onto something that couldn’t be blocked. I opened the draft with a Valkyrie Arcanist out of a weak pack, then immediately followed it up with Malediction Reader (wondering what someone took over this…) and another Arcanist, which set me on 6-drops for the rest of the draft. I opened Memory Dredger in pack 2, then took Emerald Ring. My third pack contained an absurd number of potential high picks for me: Stand Together, Beastcaller’s Amulet, Rapid Shot, and Dark Return. This was a tough pick. I eventually settled on Amulet because I had so many flyers, but I think I actually should have taken Rapid Shot. Stand Together was obviously the most powerful pickand I did have a Xenan Stranger (not in the final deck). 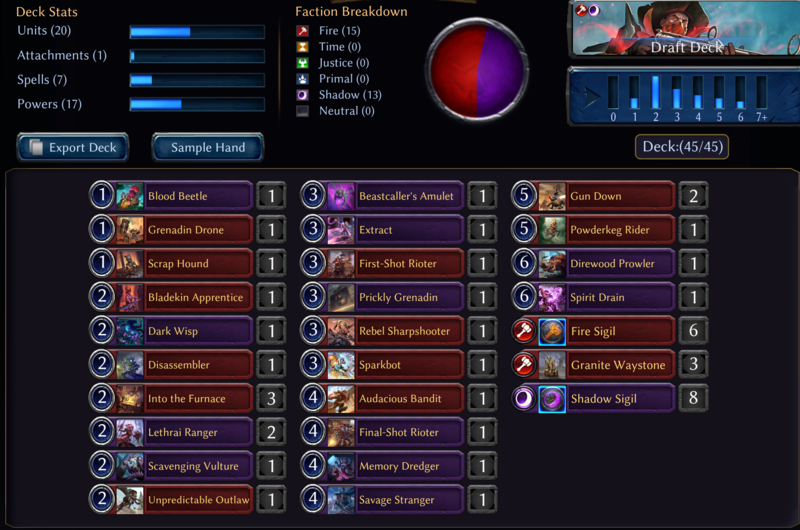 However, my deck already had a lot of raw power, and I didn’t see the need to stretch my factions if I could avoid it. What this deck had over the previous one was a way to go deep in the game and go toe-to-toe with more controlling decks. The top of the curve was not only stacked with evasive threats, but it was also full of card advantage and mana sinks. When your top-end threats can pull double duty like that, you are in great shape. I would have loved to see this deck make it to 7 wins, but I think I needed one or two pieces of efficient removal over some of the 2-drop dorks for it to truly be a 7-win masterpiece. Sorry Primal and Time, better luck next set. I’ll have to go back through all my reports and do a compilation spreadsheet or something, but I almost always find myself in Justice, Shadow, and Fire in some combination. Maybe once Set 4 (finally) releases, I’ll write up a recap article for Dusk Road. My first pick Into the Furnace was followed by a string of solid Fire cards. Initially, I drafted Justice late in Pack 1, but I waffled on Pack 2, Pick 1, where the only good card in the pack was Extract. I was rewarded with a 4th (!!!) pick Memory Dredger, which was signal enough for me to get the hell into Shadow. I also got what I referred to in my drafting notes as “The Latest Gun Down in History” 10th pick. Seriously, that is a splashable removal spell, people! This deck was, I think, in-between the first two decks in power, as its record appropriately indicated. It leaned aggressive, obviously, but it had a lot more interaction than the first deck while having less late-game power and evasion than the second deck. Memory Dredger was the MVP again, winning one game that very few other units could. My opponent had a stacked-up ground-pounder, but Memory Dredger just kept on plinking in for 3 in the air whilst dredging up a repeated chump-blocker for me. Triple Granite Waystone also did a ton of work, allowing me to go wide and keep my opponent from racing me easily thanks to free chumps. It’s rare that I say this in draft, but I would have loved to have a Rally in this deck. The play I’m most proud of making is slamming Dark Wisp into the red zone immediately on turn 3, pretending I’m stuck on 2 power and frustrated. My opponent declined the free block with their Stranger, allowing me to play my third power post-combat and get value out of my Sparkbot. Another middling week for me, but such is what happens when you go 2-3. Even if my new pack is bad for me (spoilers: It was only okay), I have to play out my remaining 24 games of Sealed this week, plus maybe 20 tiebreakers if I think they’ll matter, so I’ll write up another report when I’ve finished that. Card of the Week goes to Memory Dredger, for obvious reasons. Even if the card had no abilities beyond flying, it would be very powerful, but the ability to rebuy a stream of 2/2s or 3/2s to trade with your opponent’s stuff when they try to race just pushes it over the top. 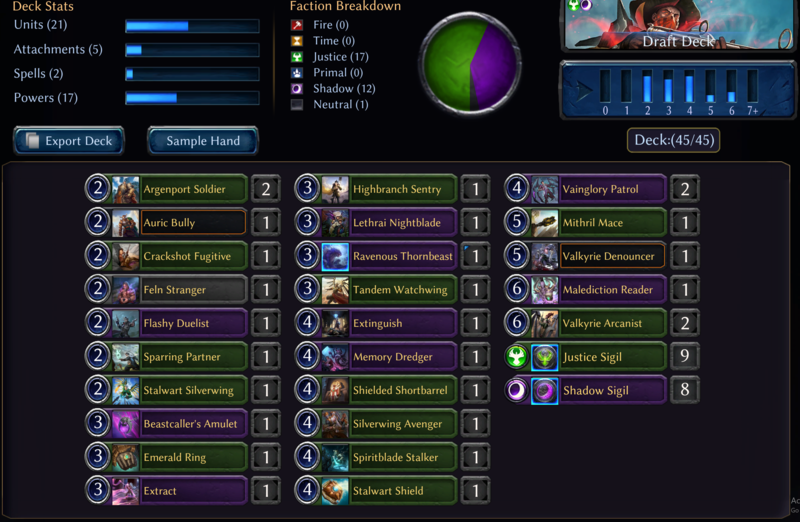 I would honestly snap-switch factions if I opened Dredger in pack 2 unless I had an extremely good reason not to. The fact that I got it 4th in one of the drafts is incredible.